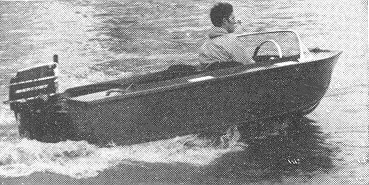 An 11 ft. single-chine runabout of the same overall size as Venturer, with single instead of double-chines - giving slightly higher speed, but not as suitable for open sea. Length 11 ft., beam 4 ft. 7 in., weight 180 lbs. 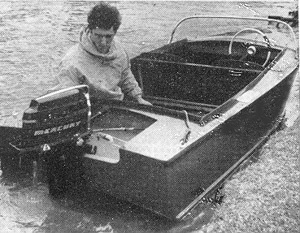 This is a good-looking craft, well-flared forward and a drier boat than many other runabouts of this size. It has a plywood skin and is built upside-down on frames. There is comfortable seating for four. There are fore and side decks and motor well, with provisions for remote controls. With a crew of two, Bosun will plane at 17 m.p.h. with a 10 H.P. outboard motor. 20 H.P. should be regarded as the normal maximum economic motor, to give speeds up to 25 m.p.h. 5 sheets 1/4" (6mm) x 4' x 8' and 2 sheets 3/8" (9mm) x 4' x 8'.